Do You Like “Ordinary” Characters? I read a gargantuan amount of contemporaries. I don’t usually label them my “favourite” genre, but I think they’re the most popular to be published, aka, I end up chewing through a stack of them every month. (I’m agreeable like that.) Through all this contemporary consuming, I’ve noticed characters seem to dangle either in the I AM ORDINARY camp or I AM EXTRAORDINARY. Apparently, there is no middle ground. There’s a definite art in combining the EXTRAORDINARY and the ORDINARY. I think a good character needs both. Too weird and wacky and there’s no way we mere mortals can connect. But to bland and plain and…why am I bothering to read about these uninteresting humanoids again?! How much “extraordinary” to ratio of “ordinary” do you like in contemporary books? Do you want someone who’s completely average and relatable in their problems in school and with homework and family life? Or do you bulldoze through piles of books until you find a character with outrageous quirks and bizarre interests plopped in the mundane world of school and difficult life decisions? WHICH DO YOU LIKE? AND WHAT’S THE BALANCE?!! Lately I’ve been reading about seriously ordinary characters. They haven’t got ANY quirky interests. They don’t even have life goals. They’re just…ordinary beans, trying to survive teenage-dom. And you know what? I bothered me. I am ordinary (well, I’m a writer, so not that ordinary) and when I read I want to experience something I haven’t (or can’t) in real life. So heck yeah, I want to read about that kid whose got a thing for aquariums, or the cellist, or who works part time in a bakery making delicious pineapple treats. When You Leave was epic because it had skate-boarding, which is something I know nothing about. In fact, the first time I tried to skate-board I was sitting down on the idiotic torture instrument, and decided to use my hands to stop myself. BAD IDEA, CAIT, BAD IDEA. Least to say, I had no skin on my hands afterwards. These books, where the character is normal BUT has intriguing interests, are what I live for. * I lie. I have no idea if the word pineapple is even mentioned in that book. But I’m a writer. I GET TO LIE AND YOU CAN’T TELL ME NO. ** I died laughing, in case you were curious. I definitely wasn’t helpful. But what about when the character has…absolutely no extraordinary tendencies? Like, nada. Zlich. No intriguing life goals. No hobbies. y into being intrigued about ONE person it’s a) kind of creepy, and b) not very rewarding. Particularly when, as in Q’s case, Margo barely even ever talks to him. 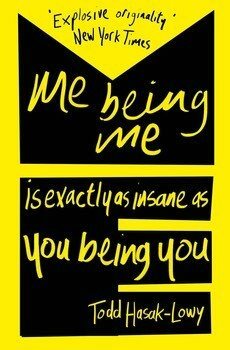 Or more recently I read Me Being Me Is Exactly As Insane As You Being You and, apart from being exhausted by the title, I was 100% disappointed in Darren who was the most unremarkable ordinary bean to ever blob in the universe. He was boring. I want the extraordinary, please and thank you. I have enough “ordinary” in everyday life. I want to read about the DJ and the writer and the kid obsessed with the 80s. I want to trot around in someone else’s shoes for a while when I read, okay?! But I should be balance. When everyone in a book has wild and spectacular interest, it’s not intriguing: it’s overwhelming. But I’m always going to pick the book where the characters have quirks instead of the ones who are just like everybody else. i definitely want your thoughts on this subject, my fungi friends! which kind of characters do you prefer reading about in contemporaries? is crazier better? or…do you feel disconnected when the characters have super weird interests? also what’s the most interesting character quirk you’ve read about?! TELL ME YOUR THOUGHTS! Crazy is better! Crazy is the pinnacle of AWESOMENESS! The way I see it, there is no such thing as “ordinary” so everyone is a little weird and I think characters should reflect this. I mean, they don’t have to have strange interests, but they should have some sort of quirk, even if it’s just being really specific about the order they eat their lunch in. I love the characters that grow by the end and learn something. Quirky characters always have me laughing and become instant favorites. I also love those characters that remind me of myself. It helps me relate to the character and not roll my eyes as much at the stupid things they do. I definitely agree with you in that too normal is boring. Like, if the character literally sits around watching TV all day then it won’t be a very interesting book. Also, real people have quirks, so why can’t characters in books have them too? I think you raise a point Cait.. something I’ve not considered before. I do think I like a mix? Sometimes I like reading about someone ordinary that goes through some MEGA STUFF IN LIFE because it just lets me be someone else for that moment, you know, but extraordinary is also wonderful because TALENTED PEOPLE EVERYWHERE, I just love getting to know amazing characters. Such a hard balance, I DON’T KNOW ANYMORE. I love all the characters! For reals. But I think quirky but relatable is probably my favorite. I would put Lola in that category for me. I agree that Q in Paper Towns was ordinary(boring) but I still enjoyed the book. I definitely prefer extraordinary characters in contemporaries. I want them to be humanly down-to-the-earth people so I am able to connect with them but with some unique quirks and characteristics to keep me intrigued. Krista & Becca Ritchie (Addicted series) and L.H.Cosway (Painted Faces,Still Life With Strings) and Heather Demetrios (Something Real, I’ll Meet You There) are authors who can definitely provide that in their contemporary novels. I know I’m probably in the minority here, but… All hail ordinary characters! And maybe I’m crazy for saying that? But I don’t know. I like the characters who don’t entirely have life goals, or passions, and yes, perhaps some people may consider them boring — and in a way can’t “boring” be realistic? I mean, I think I’M a boring person. Apart from my writing and photography, which are literally the only interesting things about me, I’m boring. I don’t go out. I don’t have any outrageous quirks. (Depends, I guess, on what you consider to be an outrageous quirk or not.) I’m wandering through life with little to no expectations of anything, or ambitions, really, but that’s okay, because that’s who I am, and I’m happy reading about that. I GET that. I don’t think, either, that a “boring” (and here I put boring in quotation marks because it’s subjective) is necessarily unrealistic, too. And cool, quirky, strange characters are GREAT as well, and I like reading about them, but I also feel like it depends on a novel. YES!..I hated Q from Paper Towns! I barely learned anything about his hobbies or interests throughout the book. I don’t like characters to be too extraordinary, because then the book turns un-relatable. But, I do like characters that have interests and a unique personality (Primrose from the book, Eggs?). I like characters that feel like real people. I’m totally OK with characters having their quirks, because our quirks are what make us individuals. But when an author tries to fill his/her book with people that are ridiculous and over the top, then it gets a bit stupid. Again, I don’t mind if it’s a comedy, because zany characters are a natural fit for that genre, but if the author is trying to write a realistic book they should make the characters realistic too. One of the things that irritates me about the book blogging community is the way that people view characters in a book. Me, I want characters that feel like actual people (I’ll make an exception for a comedy, as I said). However, most other people seem to disagree with this. They want characters that are basically perfect in every way. They have to be quirky, have a perfect moral compass, be incredibly attractive, be funny and basically be the perfect human being. This means that loads of books are packed with characters who don’t feel like actual people. Basically, my point is that, yes, extraordinary characters can work, and they often make books very memorable, but for me they feel like real people. I feel like the quirks need to have a place in the story right?! Like they need to be USEFUL to the plot. I know it doesn’t always work that way IRL, but IRL-rules don’t apply to books, eh?! 😉 When it’s too crazy it feels forced. *gasp* I was going to post yesterday (but I didn’t manage to finish writing it in time) about why I stopped writing a contemporary because my characters had very few goals but to finish uni and get together. I was bored writing it, you know. I should have posted – it’s funny we were both thinking about contemporaries yesterday. I’ll see if I can write it tonight – but no guarantees. Interesting hobbies are LIFE. Although mine isn’t that interesting…reading?!! Taking photos of books and dogs? I SOUND LIKE A CRAZY CAT (DOG? BOOK?) LADY IN THE MAKING. Nice post idea :D!! I do but don’t read a lot of Contemporaries… I like to stick to science fiction and fantasy because I face enough of reality in one day haha. GASP! You struggled through Paper Towns?!? I loved that book (but you have a point with creepy Q…) and my opinion isn’t biased (it really is, my friend sent it to me as a surprise)…. Well if I DO read Contemporary, I’d rather have a main character who has a strange/unique/cool/crazy passion because, for me, that makes it more interesting. I like characters who like things I’ve never thought of before like famous last lines (Looking for Alaska… I wasn’t a fan of Pudge D:) or sports like Boxing (Melt :D)!!! BUT WAIT I ACTUALLY DID STILL LOVE PAPER TOWNS!! I had issues with Q’s creepiness, but it was so funny and loveable anyway. xD I’m biased. I love anything written by John Green. Wait, have you read This Song Will Save Your Life? Because, well, you SHOULD. And yes for Lola and the Boy next door. It’s amazing how both disliked the same books as well, like Paper Towns and I Am the Messenger. But then, PT is still the second best John Green book I’ve read. Abundance and Looking were just no for me. YES I HAVE READ IT AND I LOVE IT. HENCE I MENTIONE DIT IN THIS POST. It basically made me cry. Idek. I like books that are painful?! What a thoughtful post! I too like characters who have neat quirks because I think we all have neat quirks aaand when I’m reading contemporary it’s still fiction so I still want escapism for dinner. I mean everyone lives their lives doing something which is entirely different to what another person is doing – and since contemporary is like people-watching but with more frequent drama I want to know about ALL the lives. And the lives have to be interesting, every quirk has to…not mean something, but it has to be quirky. Something you wouldn’t do. Or at least, something you wouldn’t obsess about doing. And by all means yes to characters who have MILLIONS of quirks and don’t even realise that their hobbies are weird as. I love characters like that. Yesss, ESCAPISM. Plus I just want to experience ALL THE THINGS, and what better way to do that than by reading?!! I love characters who are weird but don’t act weird, you know? I like it when ordinary characters are put in extraordinary situations. I want to see the lives of ordinary people shaken up by something intense and crazy. Their reactions are interesting to me. If a character is TOO ordinary (no goals or hobbies), then that’s just lazy writing on the author’s part. Everybody has quirks, interests, plans, etc. Characters should have those things too. And it makes for interesting and exciting character development, right?!! LOVE THAT. It helps with character development that’s for SURE, and I do love some awesome character development. I think I like believable characters. And for me, that could be a totally over the top person or an ordinary one. As long as the author can make me believe in who this character is, zany or boring, I like it. I completely agree with you about Q in Paper Towns. I read it a couple of weeks ago and I was really underwhelmed. I loved TFIOS and Looking For Alaska, but Paper Towns was very bleh for me. I don’t mind ordinary characters, but I like them to have a great personality rather than being like Q. I loved Anna, Lola, and Isla and all the characters in those books because they were realistic and all had a personality. Interesting question! I think I’m more prone to liking characters that start out ordinary and, through trials and tribulations, gradually discover their extraordinariness (Like Bilbo Baggins or Harry Potter, who are both pretty regular people until they show great courage and tenacity to get through the problems they’re up again.) But then, I read a lot more fantasy than contemporary, so that’s kind of the way of the genre. In contemporary fiction, MCs with talents and special interests are way more interesting than bland characters who just kind of … exist. Character development = my one true love. We have this saying on my newspaper staff: “Everyone has a story. You just have to find it.” That same principle is what makes Humans of New York so popular. Ordinary people in real life have little traits and quirks that make them extraordinary, and I think book characters need to be that way, too. I struggled with Paper Towns for the same reason you did. I want to read about characters who have healthy obsessions, passions and aspirations like I do. I love that saying. I ADORE THAT SAYING. I completely love HoNY for that exact reason — no one is bland and thoughtless. NO ONE. Which is why it bugs me when books present characters who just don’t have any brains. >.> I don’t really believe people are like that. I like that…”fabordinary”. THAT IS AN INCREDIBLE WORD AND SHOULD BE USED ALL THE TIME. I actually find characters with no interests/talents more unrealistic than ‘normal.’ It definitely bothers me when their only interests are the ones essential to the plot – I feel like they don’t have a life! Everyone has something, even something small, that makes them different from everyone else. I think everyone has interests…I mean, how is it possible not to?!! I don’t believe anyone is boring or unremarkable in real life — so I don’t think it should be that way in books either! I’ve never thought of whether I prefer ordinary or extraordinary characters…but there definitely is a balance. Every character needs to have something to them, but they also need to have flaws. I don’t tend to read a lot of contemporaries because of this reason; most of the characters are so dang ordinary! The few contemporaries I’ve read and enjoyed have interesting characters: a fanfiction writer, a 13-year-old detective, a woman who works for a popular cooking magazine, a girl who lost her leg in a car accident. And I love twisted, not-easy-to-like characters, even if I hate their guts. That doesn’t make sense. Does it? THAT MAKES SENSE. IT DOES. Characters don’t have to be “Likeable”, per se, they just need to be complex and interesting. I love this post Cait! And I’m so glad you brought it up because I feel like that’s what I’ve been missing in some of the books I’ve been reading lately. Like for example, I’ve noticed it’s been harder than usual to connect with characters (mainly because they have no feels, quirks, reactions…) nada. zilch. and what a disappointment it is. I want the weird quirks something to make the character stand out. YES! I’ve found that too! i’m reading a whole slew of books that just feel so bland…and this is probably why, right?! Have you read Mosquitoland yet? I think you should. Mim is definitely not ordinary. Paper Towns bored me out of my mind as well. I definitely prefer reading about characters with quirks, because I think that DOES make them more realistic. I don’t think “just like everybody else” exists, EXCEPT in books, movies, and TV shows. I reeeeeally want to!! My library doesn’t have it yet, but ONE DAY I SHALL READ IT. Sometimes, one feels, the author sort of …. plonks a talent on a character. In the group of MCs, as it were, there might be one who’s a musician, another who’s really good at drawing. In fact, the percentage of musicians and artists in books is probably a lot higher than in real life, in my experience! Sometimes, “ordinary” characters are relatable … ish. There are plenty of people, I think, who don’t have any hobbies – especially school-aged people, who are mostly focussed on work and friends. But to me, that heralds somebody who can’t really be bothered with life. It’s not as if some genius talent is going to tap them on the shoulder one day. They need to *find* a hobby! Best characters with quirks? The one that springs to mind is GANSEY. The quest for Glendower. Also Ronan and his Latin studies. And Blue and her cool clothes and the poems written on her ceiling …. Basically, Maggie Stiefvater is the queen. But then we knew that already. Basically I 100% agree that Maggie Stiefvater is queen and I’m just going to be here moaning and crying because GANSEY and Im’ terrified he’s going to die but I love Blue and Ronan and Adam and Noah and I think they all have so much depth and quirks and interests and *pauses to gasp for breath* JUST YES TO ALL OF YOUR COMMENT. I love extraordinary characters! I love characters with quirky habits and personalities.Because if I am going to spend lot of time to read about a certain person,I WANT THEM TO BE INTERESTING! I recently read Adorkable by Sara Manning,and though it was only an okay book for me,I loved the MC!She was a lifestyle blogger,a messy,bossy,proud,rude and utterly hilarious girl.It was awesome!I want characters like these! Hopefully when I write a book (I said when,not if. See,I’ve improved! :)),I’ll create someone interesting,not a normal teenager whose sole interest is the person they have a crush on. For me, a like a little bit of weirdness but I like characters to also be relate able. I like how authors give characters little quirks to make them different to other characters and I don’t think I’ve read a book, really, where the character is 100% normal because, who are we kidding, we’re all a little weird and I think without little character quirks, books would be insanely dull to me. Yes…what defines “normal” exactly?!! IT’S TOO HARd. I guess by “normal” I just mean no hobbies or interests to speak of…I find that tedious and weird. I don’t consider ordinary and boring to be synonymous. I don’t like boring characters, but I do love ordinary ones. They are more realistic and true to life. I don’t usually like characters that are randomly and unrealistically special–unless it’s a fantasy or something. I like my “ordinary” characters to be well developed and experience some sort of growth throughout the story. Ah, yes, I would agree with that, and I probably wasn’t very clear about that in my posts, eh? Ordinary doesn’t HAVE to mean boring. I want characters to be interesting. And, more to the point, if they have a hobby, I want to see them doing it. Not just, “Mary loved to collect broken aquariums and fill them with crumpled cereal boxes and jelly beans,” and then we never see her do anything of the sort. I’ll read about any characters, extraordinary or not… if the story is written well. A good writer should be able to sell both. Poor Mime. I feel her pain. At school, I sewed a beret to my school uniform and wasn’t allowed to use the machine again all year. Yeah, I’m not all that crafty and probably dangerous with machinery, good call stupid school. I dunno really, it’s a hard one. I think I edge more towards the extraordinary, mainly due to being an older reader and teen dramas really aren’t relevant to me any more. Even as a teen, I can’t image having spent 300 pages of anything dwelling over any boy. No tool is worth it. But likewise, I love to read about the teen who’s talent is celebrated, through art or music especially. The teen who says stuff boys and I don’t need a boyfriend to feel complete. Where are THOSE girls? I think authors just automatically assume that ever MC needs a love interest. Tell them Cait, tell them they don’t. Aw, no one trusted you after that Kelly? I WONDER WHY. HEHHHHH. okay, I’ll shut up now. I’m so unhelpful. I was a teen like, um, yesterday, and I never spent that much time angsting over what a single human thought. I was too busy reading books and planning to marry Batman to really care about mortals. No wait. Either I was marrying Batman or I was gonna murder him and then BE him. I don’t think I had any other ambitions. I WILL TELL THEM, I PROMISE. I want to read about anyone except the cardboard-cut-outs. ERGH. They make me weep. Hmm, tough question. I guess I would say that love ordinary characters, who have extraordinary interests. I don’t want to read about a character who’s completely dull and uninteresting. But I don’t want to read about someone who’s SO out there that I can’t relate to them at all. Actually, I might even have to switch up your definitions of “ordinary” and “extraordinary.” The characters you described as “extraordinary” to me sound like normal people. The ordinary people sound odd. (Your life revolving around one person? WEIRD). I guess what I really like is when an author can take a normal, relatable person and make their lives seem extraordinary to me. Yup. Sounds about right. Oh, I definitely agree with you, Cait. But I think it also depends on what you define as “ordinary.” On one hand, a person’s regular life might consist of dancing 20 hours a week and practically living in a dance studio, while on the other hand, another person’s regular life might be the monotonous go to school. do homework. hang out with friends. Both lives are very different but ordinary at the same time. So I think it just depends on the person in question. I, personally, like a mixture of both. It’s always fun to have two different characters that complement each other properly. I guess I’m just defining “ordinary” as someone who goes to school, sleeps, hangs out with friends and does basically nothing exciting. No intriguing hobbies or defining characteristics? Very very ordinary…but I totally know what you mean! I think my life is ordinary, but someone in another country wouldn’t think so! Balance, absolutely. And yeah, we want the extraordinary! Why do authors think we people read fiction? But on the other hand, we want to be able to relate to them on some level. It’s a balance we need, right?! While I do understand the theory behind writing books about “ordinary” people, I agree that, for the most part, I’m interested in reading about people who are at least a little more towards the “extraordinary” part of the spectrum. If I wanted to read about 100% realistic and possibly boring things…well, I wouldn’t be reading. If I wanted this experience I would just go out and live my own life, going to school and buying groceries or whatever. I do like “ordinary” characters in extraordinary circumstances (Frodo). I guess I’m mostly not interested in reading about ordinary people in ordinary circumstances. YES! It’s like we need that balance. Extraordinary people belong in ordinary circumstances, and vice versa. Frodo taking the quest. Or Augustus Waters finding love/surviving illness. x) I love the contrasts! When it comes to characters I think the crazier the better! I don’t know about you guys, but a lot of the time I read to escape ordinary life. I’m not saying I dislike all books with ordinary characters… it’s just that when the characters don’t do anything out of the ordinary, I feel kind of disappointed. I really like this one quote I found that goes something like this: “The one who reads has lived a thousand lives.” I think that’s really accurate. And of those “thousand lives” I get to live, I want most of them to be unique and exciting. Me toooooo. I WANT THE EXTRAORDINARY. My life is normal. Why do I want to read about normal?! WHY. I love that quote. I want to live a million lives. I completely agree with Paper Towns – I think that’s why I didn’t get into it too much. I had a connection with the characters, but nothing extraordinary. It was just an ehhhh kind of thing. I have so much love for the Lizzie Bennet diaries. MOSTLY JANE. For the most part, I’m with you. I want someone who is different. I want to do and experience new things through the book. Or even just someone who thinks differently than myself. Get a new perspective. But the latter doesn’t necessarily have to be extraordinary, just different from myself. A character doing ordinary things may have a completely different perspective on those things then I do. But I also don’t mind when the characters are ordinary if they are thrown into extraordinary circumstances. For instance, in Age of Ultron we, or I realize that out of the whole team, Hawkeye is a rather ordinary guy. He has a- okay, I don’t know if you’ve seen it, so I won’t say. But it’s especially evident when he tells someone that “The city is flying. We’re fighting robots and I have a bow and arrow. None of this makes sense!” And even when he walks away he’s still like, “the city is flying. . .” And you know, I like Hawkeye. I like him even more now, because he seems more human and relatable to me. But at the same time, he has just enough different to be interesting. Yessss, oh you said it so much better than me in my entire POST. xD Haha! BUT YES. I read to see life from a different angle and to experience new things! I always pick up the book with the character with the cool quirk first. I just can’t help myself. Ah, yes, Hawkeye. I haven’t seen AoU yet, so shhh for spoilers yes! XD I will see it eventually. Isn’t Hawkeye deaf in the comics?! Okay. So extraordinary characters are neat because you’ll likely gain a new perspective. And I like that you know? Because reading is like an escape from your own life and with extraordinary characters you can vicariously live a whole other way of life that’s so different from your own. I also find that extraordinary characters tend to more unique as they’re created on purpose to be not like other characters. They have bigger and more interesting problems. However, sometimes extraordinary characters can see contrived. Like “oh my god I have 48590480 horses, can play the kazoo and I’m not like all of those other girls” (thought I’d throw in some internalized misogyny for fun) characters can become so unrealistic that I can no longer suspend my belief. This is especially the case in contemporaries in which the genre itself is supposed to feel a bit more realistic than say sci-fi. Ordinary characters are nice when I’m looking to read a book I can intrinsically relate too. Ones that I can nod along with and feel kinship with a character who is going through the same things I am. They’re a lot more realistic than the extraordinary. However, these characters do tend to feel pretty mediocre when compared with the extraordinary. They seem to fall in line with a lot of tropes too. SO. In summary: LARISSA CAN NEVER MAKE A CONCRETE DECISION AND ALWAYS INSISTS ONE BRINGING OUT BOTH SIDES OF THE ARGUMENT. HELLO INDECISIVE, LARISSA. WELCOME. 😉 Ahhh, I’m just kidding. If you want to see how indecisive I am, make me pick my favourite ice cream flavour. Omg. It’s too hard. ANYWAY. I definitely don’t like reading about characters that have my eyebrows twitching and need a heavy dose of suspended disbelief. That does NOT do it for me. I neeeed them to be realistic. And by “extraordinary” I don’t mean they have to shoot lasers out of their eyes. I just want them to have interests and quirks and goals and interesting thoughts in their skulls instead of coasting through life being a blob. **sigh** I totally see where you’re coming from and I AGREE. Oooooo! Interesting post! I tend to like the extraordinary characters. As much as being able to relate to a character is important in a book, I tend to read for an escape. I don’t want to relate to their boring life existence; I want to escape mine! When it comes to connecting with a character, I want to be able to relate to their emotions and feelings. No matter how quirky or different they are, everyone has the same core emotions, so, as long as those are well written, I’m happy! EXACTLY. Omg, you have summed my feelings up so well. I want to pretend to be extraordinary with the character while I dive into their story. THAT IS WHY I READ. I like my characters to be mostly ordinary, but I definitely get bored if they don’t have any quirks or cool characteristics. I get really annoyed with the whole “CHOSEN ONE” trope which comes up a lot in fantasy (which is mostly what I read). It seems like the main character is always the ONLY ONE who can fulfill some prophecy or is the BEST ASSASSIN IN THE WORLD or is the MOST BEAUTIFUL in all the land…it gets tiresome. I guess my favorite type of character is Ed from I am the Messenger or Kaladin from the Stormlight Archive – someone ordinary who discovers they can do extraordinary things. I don’t mind the over-the-top extraordinary if the MC had to work for it or discovered it slowly; I get annoyed when you’re just told that someone is special straight off the bat. Ah yes, those Chosen Ones do run rampage in epic fantasy, don’t they?! I kind of like it…because it’s usually interesting. BUT. I’m also kind of tired of it. I do want to read about someone who saves the day who isn’t magically enhanced. hah. I think a nice blend is best. Like, if a character appears mostly ordinary, but as you get to know them, they have personality in droves. Quirks, or ambitions, or a decided lack of ambition to the point where it is a quirk in itself… whatever. I need something different, no cookie cutters, no robots (unless there are actual robots, but then I don’t think it’s a contemporary anymore…), no “blah” characters. I cannot stand those. As for the weirdest quirk? My goodness, I don’t know! I am going to think about it, and if I think of one, I will let you know! Blah characters are the WORST. And I just don’t understand how people can have no interests/ambitions. How can one even fuuuunction in life without goals and plans?!! I also find myself eating up a lot of contemporaries quite often, and most of the time as long as the main character has a unique and/or easy to read voice, I’m okay with whether or not they’re ordinary or extraordinary. I’ve love books with the former (like Simon from Simon Vs., who was an ordinary gay kid who loves Oreos, and Max from Liars, Inc. who is just your average Joe on the run from the FBI) and the latter (like Lola, and and Josie from Love and Other Foreign Words who was quirkily intelligent and overgeneralized everything). So I guess I’d say I like both types of contemporary narrators! I believe there is more than enough ordinary in this word already. I don’t like reading about it. I don’t live coming into contact with it in the real world either. Does that make me rude and standoffish? Maybe. But I don’t mind. That’s probably why I don’t have loads of friends flocking themselves on me. But there ones I do have, I can assure will make hanging out with them worthwhile. Because they are interesting and they have things to share. And there are things I can learn from them. I am bored of ordinary. It’s not interesting. It’s not exciting. Why surround oneself with it? And why for god’s sake would people (well, mainly me) want to read about it? Ok. So I probably sound horribly pretentious at the moment. But COME ON. Most ordinary characters or SO FREAKING ordinary that I hate reading about them. They are usually also ignorant. But you know what is even worse than that? Characters who THINK they are extraordinary. Who THINK they are better than anyone else just because they have one or two quirks and see and realise things no-one else does. No. Just no. If someone is going to be an ignorant special little snowflake, they might just as well stay ordinary and try to at least not get on my nerves. Anyway… sorry for the essay? Duuuude, you don’t sound pretentious. I JUST WROTE THIS POST SAYING THE SAME THING. HAAH. I want extraordinary. I want to be amazed and enthralled and excited. I prefer interesting characters. Or ordinary(ish) characters who are extraordinary circumstances. I don’t mind if a character starts out being a little boring, and then becomes more interesting – that’s good character development. But I will complain if a character is boring during the entire book. Good character develeopment is my FAVOURITE. Although, I still get twitchy when a character starts off too boring, you know? There has to be a little something that sparks my interest right at the beginning. I like my characters to be special in some way, but also to be relatable. That happy medium is the ultimate aim, right?! I like ordinary characters with extraordinary skills/thoughts/actions. Like, I do like Ed from ‘The Messenger’. I thought it was nice that he(and his three friends) was such a loser. But I also like when an ordinary person that I can relate to, finds an extraordinary courage or learns and extraordinary skill or something like that. Mostly, I’m on ordinary – but I think maybe my definiton of ‘ordinary’ is a lot broader than most people’s. It’s true! Sometimes those “ordinary” ones have the best connection with us readers, right?! But tat the same time, I guess if I had to pick between understanding or experiencing something new? I’d go something new. THIS IS THE PROBLEM CAIT. THIS IS WHY I CAN’T LOVE SO MANY CONTEMPORARIES. Because why would I want to read about ordinary life, that happens to ordinary people when I can read about enchanting fantasy creatures in magical lands? I will choose the extraordinary or the mutant life every time, it’s just much more interesting. THIS IS ME TOO 100%, JEANN. I’m a firm believer that everyone is interesting, so I die at books where the MC is not interesting and seems to have no ambitions to speak of. How do people exist like that?! I DON’T GET IT. I definitely go for the crazier characters. If your character is absolutely boring I find it a) a snooze to read and b) kinda unrealistic. I’m a firm believer that every human being is interesting in some way. I mean don’t we all have our quirks and dreams and pet peeves that make us who we are? I don’t require that every single character be a bombastic overwhelmingly overflowing with quirks and craziness kind of individual, but I don’t think it is too much to expect that characters be at least as interesting as human beings are. I BELIEVE THAT TOO!! I refuse to believe there are people who have no interests or motives or…original thoughts. It can’t be possible. right?! And SO TRUE. It doesn’t have to blow your mind. They just have to have depth. So I predominately read fantasy, so I do love me some extraordinary characters. But I also like when they are relateable. They can’t be too powerful or speshul, because then I get very picky. I’m a hard customer. But then there are books I adore, like Fangirl, where the MC is more ordinary (as in doesn’t have super powers at least) and I still am obsessed. I think it is a fine balance, really. I guess I have a range of normal to extraordinary and my favorite characters fall in between. Oh, I agree! It’s not so much “special snowflakes” I’m after, but characters with interests and quirks and character development. I can be picky too.xD I just don’t want to read about blobs who coast through life, you know? First thing I need to address: That Lizzie Bennet Diaries GIF is ON POINT. Okay. Now, to talk about characters in contemporaries… I prefer reading about people who have cool, unique interests. I even sometimes like totally bonkers characters because they’re so much fun to read about. I don’t like boring people. (My mother has always said to me, “I never want to be ordinary.” Preach, mamma. You’re mah hero.) One of my biggest pet peeves is characters I don’t care about, characters who don’t have a special something that make me connect and feel invested. But apart from that, this was excellent. I personally like ordinary, “kid-next-door” style characters, but I agree that they need to have SOMETHING interesting about them if I’m going to read a whole book about them. I’ve recently read a lot more contemporary and I agree. 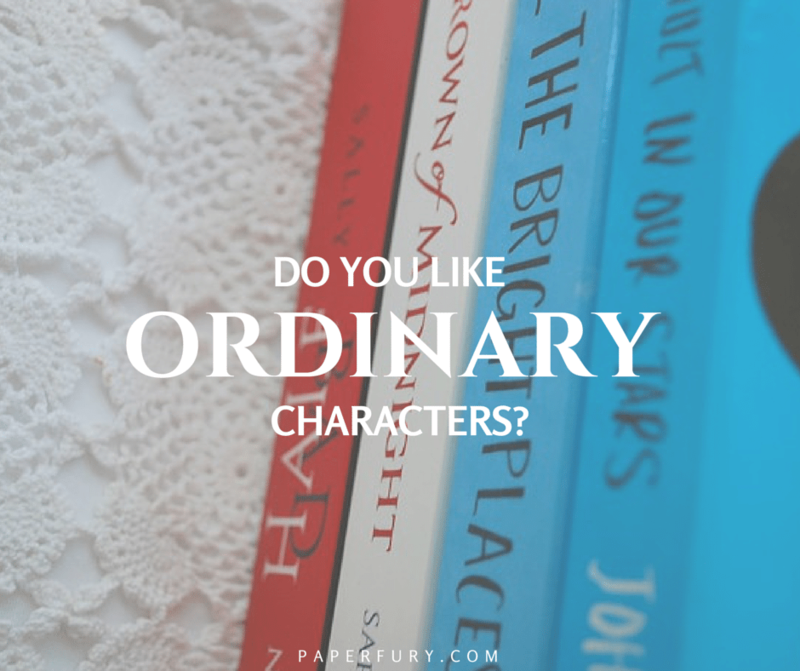 I love my ‘ordinary’ people with a bit of quirk (I’m pretty content with super hilarious characters or the very snarky, too). They don’t have to be super extraordinary, but when it comes to a balance of ordinary vs extraordinary, I rather it lean towards the extra. Bland characters are the worst, because than I don’t careeee. Yes to weird interests! I’ve been reading this contemporary romance series, and the characters (a whole family!) are hilarious because they have the biggest (and I mean biggesssstt) obsession with food, and I love food and it makes me happy, ha. YESSSS. This is me 100%. I really need an extra shove to care about a character, so the more extra the ordinary is? The more I’m in love. Omg. THEY HAVE AN OBSESSION WITH FOOD?!! What is this series. I need it. I so love this topic! Like you, I enjoy contemporaries and that’s probably because of the characters — they’re much more relatable than characters from say, classics or fantasy. And I’ve noticed that I end up loving the book more when I’m able to empathize with the character. That usually happens when the character’s ordinary. I do get your point though. I am also ordinary (though sometimes I like to think I have hidden superpowers) and I want reading about characters that have a little something special about them. A great example would be Erin from Miss Fortune Cookie: ordinary high school student, a bit of a nerd, has friends who are either crazier than her or nerdier than her (so she’s in the middle ground), but she has an anonymous advice column (and that made all the difference). Also, Bianca from The DUFF. She’s pretty normal but she’s a DUFF and a very cynical one at that. Unfortunately, I have to say I like “ordinary” protagonists. If a characters too weird or quirky, I don’t find them believable. If I wanted fantastical and weird people I’d pick up a fantasy book or at the very least a magical realism book. I am not saying quirky people are bad and I do like to pick up books with characters like that everyone once in a while but my preference is still “ordinary” peeps – as long as they aren’t toooo boring and ordinary. You’re right – balance is really the key! And I feel like if they are too extraordinary it just feels too convenient of the author to write them like that. But I do like it if it’s done well and instead of being told how awesome they are, the character then explains or explores different sections of the stuff he/she is good at. Character A: Main character. Bland- not pretty but not ugly. Shy. Doesn’t understand why the popular hot guy would talk to her. But likes books so we can connect with her or whatever. Character B: Best friend of the main. Always beautiful, always flirty, always passes from boy to boy. Not even really a good friend. These two have nothing in common, like, why are they friends at all? And then there’s Character C: The hot, popular guy who’s *SURPRISINGLY* (like, is this even ever a surprise to anyone?) actually really smart and caring. I am so SICK of how every book is about the same two people! I don’t read much contemporary myself, but even some fantasy can have this problem. Sorry, Twilight fans, but Bella is my example. Everyone is unique and I think people that are completely bland are pretty abnormal. Everyone has something special about them. I like reading about people that decide to break out of the status quo. Why do I want to read about people who are just like everyone else? I completely agree with you, although like you said, it’s so hard to find that balance! At first I was like UM WEIRD CHARACTERS FTW but then I thought about all the books I’ve read where the character was just a bit too weird for my tastes and I DNFed the book xD My favorite characters, in books/movies/tv/whatever are the ones that have quirks and flaws because it gives them depth. Funnily enough, it’s the less than regular book characters that seem more real, you know? I don’t read a lot of contemporary YA, but I do read a lot of middle-grade and it seems to me that, in middle-grade at least, even “ordinary” characters aren’t so very ordinary. Most of them have some sort of talent or interest or hobby that sets them apart. And that’s realistic, isn’t it? Even the “ordinary” people you know in real life are probably really good at baking or play the piano or have a secret penchant for geometry. Maybe middle-grade is better about this because there’s less emphasis on romance, so you don’t typically have the protagonist doing nothing but sighing over the guy or girl next door?